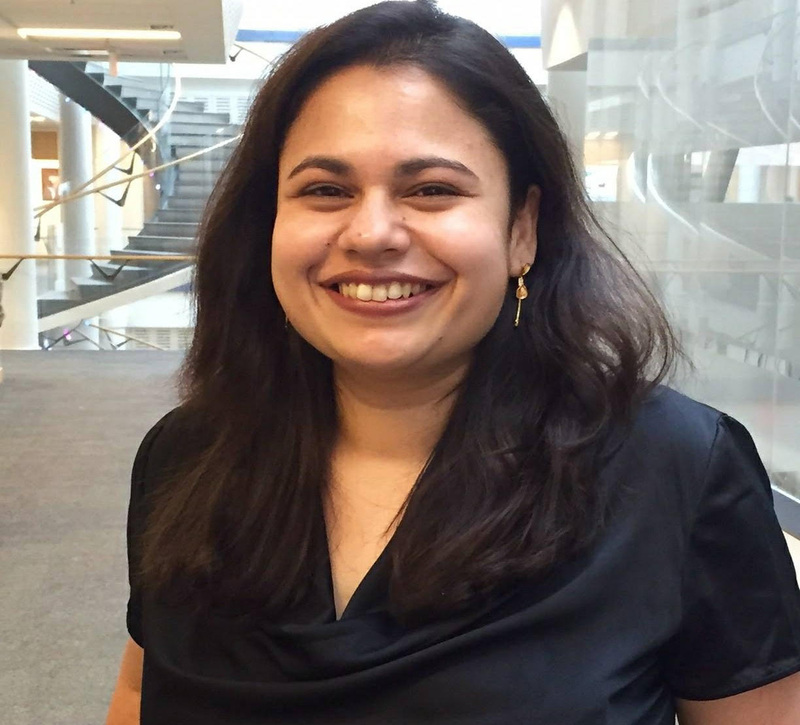 Prof. Reetuparna Das has been selected for a 2019 Sloan Research Fellowship by the Alfred P. Sloan Foundation for her work in developing novel hardware architectures. Moore’s law is ending soon. Global Foundries, a leading semiconductor manufacturer, recently halted the development of 7nm process technology and beyond, signaling a tectonic shift in the industry roadmap. Demand for computing, however, continues unabated. To meet this demand in a post Moore’s Law future, Das develops new architectures that improve performance by orders of magnitude through the more efficient use of available transistors. Her research focuses on Artificial Intelligence (AI) and precision health applications. Over two-thirds of a processor (specifically its caches) and all of a computer’s main memory are devoted to temporary storage. Today, none of these memory elements can perform computations. But could they? Das’s research addresses this fundamental question, and proposes to impose a dual responsibility on memory: the storage and computation of data. Prof Das and collaborators proposed techniques that re-purpose cache memory arrays into a million bit serial arithmetic logic units. This style of in-memory computing morphs memory arrays into massive vector computation units, providing parallelism several orders of magnitude higher than a contemporary GPU. Additionally, it saves energy spent shuffling data between storage and compute units – a significant concern in Big Data applications. Caches that compute can be a game changer for AI. They can add accelerator capabilities to general purpose processors, without taking up significant space on the chip with a dedicated accelerator. Accelerators, like Google’s Tensor Processing Unit, are hardware components designed to perform a single computation operation extremely well. They’re often integrated with more general computation units to speed up specific applications, but take up chip space for that one task. Das’s research showed that caches capable of performing these operations instead can improve processor efficiency in Intel Xeon chips by 629x for convolutional neural networks (CNNs). Application- or domain-specific processor customization is another approach to sustain growth in the post Moore’s law world. Das is targeting precision health, a domain whose growth is far outpacing Moore’s law. This new field of healthcare research aims to target diagnoses to the specific genetic and environmental factors of an individual, rather than applying population-based diagnosis and treatment. To do this, researchers require detailed information about the patient’s genetics. The cost of gene sequencing necessary to do this work has dropped precipitously – costs have plummeted from $10 million to $1000 in just the last decade. It is expected to fall to less than $100 in two years, at which point gene sequencing may become as common as blood tests. Countries like the UK plan to sequence all of its citizens by 2025, producing massive amount of data. To put this challenge in perspective, Facebook is estimated to store about 0.5GB of data per user. The data from gene sequencing takes up 300GB per human genome. One blood test for liquid biopsy produces up to 1TB. Custom hardware that can efficiently analyze these large volumes of data is crucial to the advancement of precision health. Today, secondary analysis for whole human genome sequencing takes around 10 hours on a server with 50+ cores. Custom solutions being developed by Das and her collaborators can reduce it to a few minutes on a single Amazon F1 FPGA cloud instance. Their genomics research group plans to leverage these significant improvements in efficiency to enable in-field, real-time gene sequencing using handheld portable sequencers. They are working with a clinical physician at U-M critical care to accomplish an ambitious goal: sequence a lung microbiome in less than 20 minutes during a routine physician visit to inform treatments for patients with cystic fibrosis. Das is a part of the U-M Precision Health initiative that brings researchers across the university together to build common infrastructure to collect and analyze genomic data. She also co-founded a precision health startup, Sequal Inc., to produce industrial-strength solutions and achieve broader impact. Das is an expert in computer architecture, with over 45 papers and 7 patents. Her research contributions have been recognized by prestigious awards. Das is the first UM faculty to be recognized with CRA’s prestigious Borg Early Career Award (BECA) for computer scientists since its inception 15 years ago. She has also been inducted into the Hall of Fame of two flagship conferences in her research area: ISCA and MICRO, and received an NSF CAREER award. She has served on over 30 technical program committees, several committees tasked with selecting award papers and is currently serving as the program co-chair for MICRO 2019. The Sloan Research Fellowships seek to stimulate fundamental research by early-career scientists and scholars. The fellowships, awarded yearly since 1955, honor early-career scholars whose achievements mark them as among the most promising researchers in their fields. Since 1955, Sloan Research Fellows have gone on to win 47 Nobel Prizes, 17 Fields Medals, 69 National Medals of Science, 18 John Bates Clark Medal, and numerous other distinguished awards.